- Space for 10 groups. - Forward speed varying from 12 to 35 m/min 4 CV motor. - Maximum panel height of 80 mm, minimum width 90 mm. - Auto program for switching on/off with pre-determined time. 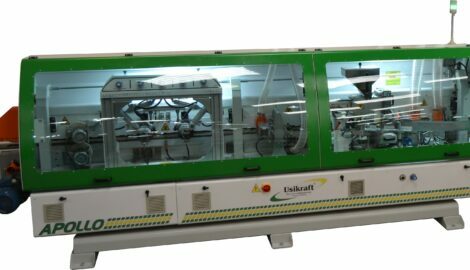 - It allows the machine to switch on even before the operator arrives in the factory; when he starts the gluing process the machine is ready and warmed up. - The operator does not waste any time waiting for the machine to warm up. - Automatic Double Spokeshave Motor 4 CV, 12000 rpm, axis Ø 30 mm (with diamond-coated tool Ø 100 mm, 35 mm height). - Straight gluer to apply glue on the panel 3 kg capacity. - Auto feeding system for rollers edges in PVC and ABS. - Glue storage with 6,0 kg capacity, attached to a pre-fuser where some glue is pre-heated and only after that it goes to the main gluer, avoiding any wastes of glue burn and assuring the correct temperature for the tape usage. - Equipped with and electronical sensor for scanning the glue level on the main gluer. - 02 high frequency motors 1CV, 12000 rpm. - Ø 100 mm saws, Widea saws. - Linear guides movements, with cast iron structure. - Responsible for the accurate cut of the tape leftover lengthwise. - (The edges of the glued panel). - High frequency motor 1 CV and 12000 rpm. - Easily removed from group if necessary. - Suction nozzle of Ø 125 mm. - It is used to obtain a perfect trimming of the piece. - Eliminates any glue wastes left by the Trimming Group. - Automatic hot air jet, used to reactivate the brightness of the scraped tape. - For channel opening from 9 to 15 mm. - For channel opening from 3 to 6 mm. - Ø 170 mm cloth disk. - 5,7” screen, with touch screen panel and colorful screen. - Forward speed of varying belt from 12 to 28 m/min. - Self-positioning System of the groups, when switching the tapes from 0,45 to 3,0 (two positions). It dismisses the manual adjustment.